Swami Vivekananda (January 12, 1863 - July 4, 1902), whose pre-monastic name was Narendranath Dutta (Narendranath Dut-tta), was one of the most famous and influential spiritual leaders of the philosophies of Vedanta and Yoga. He was the chief disciple of Ramakrishna Paramahamsa and the founder of Ramakrishna Math and Ramakrishna Mission. He is a major figure in the history of the Hindu reform movements. Narendranath Dutta was born in Shimla Pally, Kolkata, India on January 12, 1863 as the son of Viswanath Dutta and Bhuvaneswari Devi. Even as he was young, he showed a precocious mind and keen memory. He practiced meditation from a very early age. While at school, he was recognized early on as an academic genius, and showed excellence in games of various kinds. He had a photographic memory, displaying the power to read entire books in mere minutes. He organized an amateur theatrical company and a gymnasium and took lessons in fencing, wrestling, rowing and other sports. He also studied instrumental and vocal music. Even when he was young, he questioned the validity of superstitious customs and discrimination based on caste and religion. But the Samaj's congregational prayers and devotional songs could not satisfy Narendra's zeal to realize God. He would ask leaders of Brahmo Samaj whether they have seen God. Their answers did not satisfy his quest for knowledge. It was during this time that Reverend William Hastie, the Principal of the Scottish Church College told him about Sri Ramakrishna of Dakshineswar. Narendra met Ramakrishna for the first time in November 1881. He asked Ramakrishna the same question he had so often asked of others,"Mahashaya (Venerable Sir), have you seen god?" The instantaneous answer from Ramakrishna was, "Yes, I see God, just as I see you here, only in a much intenser sense. God can be realized," he went on, "one can see and talk to Him as I am seeing and talking to you. But who cares? People shed torrents of tears for their wife and children, for wealth or property, but who does so for the sake of God? If one weeps sincerely for Him, he surely manifests Himself." Narendra was astounded and puzzled. He could feel the man's words were honest and uttered from a deep experience. He started visiting Ramakrishna frequently. At first he did not believe that such a plain man could have seen God, but gradually he started having faith in what Ramkrishna said. Though Narendra could not accept Ramakrishna and his visions, he could not neglect him. It had always been in Narendra's nature to test something thoroughly before he could accept it. He tested Ramakrishna to the maximum, but the master was patient, forgiving, humorous, and full of love. He never asked Narendra to abandon reason, and he faced all of Narendra's arguments and examinations with patience. In time, Narendra accepted Ramakrishna, and when he accepted, his acceptance was whole-hearted. While Ramakrishna predominantly taught duality and Bhakti to his other disciples, he taught Narendra the Advaita Vedanta, the philosophy of non-dualism. During the course of five years of his training under Ramakrishna, Narendra was transformed from a restless, puzzled, impatient youth to a mature man who was ready to renounce everything for the sake of God-realization. In August 1886, Ramakrishna's end came in the form of throat cancer. After this Narendra and a core group of Ramakrishna's disciples took vows to become monks and renounce everything, and started living in a supposedly haunted house in Baranagore. They took alms to satisfy their hunger and their other needs were taken care of by Ramakrishna's richer householder disciples. Soon, the young monk of Baranagore wanted to live the life of a wandering monk with rags and a begging bowl and no other possessions. On July 1890, Vivekananda set out for a long journey, without knowing where the journey would take him. The journey that followed took him to the length and breadth of the Indian subcontinent. During these days, Vivekananda assumed various names like Vividishananda (in Sanskrit, Vividisha means "the desire to know" and Ananda means "bliss"), Satchidananda, etc. It is said that the Maharaja of Khetri, Ajit Singh, suggested to him the name Vivekananda because of his discernment of things, good and bad. Viveka or discrimination between the eternal and the transient was highly valued by the Swami, who, recollecting that Keshab Chandra Sen used to call him by that name, accepted it. During these wandering days, Vivekananda stayed in kings' palaces, as well as the huts of the poor. He came in close contact with the culture of different regions of India and various classes of people in India. Vivekananda observed the imbalance in society and tyranny in the name of caste. He realized the need for a national rejuvenation if India was to survive at all. He reached Kanyakumari, the southernmost tip of the Indian subcontinent on 24 December 1892. There, he swam across the sea and started meditating on a lone rock. He thus meditated for three days and said later that he meditated about the past, present and future of India. The rock went on to become the Vivekananda memorial at Kanyakumari.
" Many times I have been in the jaws of death, starving, footsore, and weary; for days and days I had no food, and often could walk no farther; I would sink down under a tree, and life would seem to be ebbing away. I could not speak, I could scarcely think, but at last the mind reverted to the idea: "I have no fear nor death; never was I born, never did I die; I never hunger or thirst. I am It! I am It! The whole of nature cannot crush me; it is my servant. Assert thy strength, thou Lord of lords and God of gods! Regain thy lost empire! Arise and walk and stop not!" And I would rise up, reinvigorated; and here I am today, living! Thus, whenever darkness comes, assert the reality and everything adverse must vanish. For after all, it is but a dream. Mountain-high though the difficulties appear, terrible and gloomy though all things seem, they are but Maya. Fear not, and it is banished. Crush it, and it vanishes. Stamp upon it, and it dies. " Memorial Plaque inside the Art Institute. The plaque reads: "On this site between September 11 and 27, 1893, Swami Vivekananda (1863-1902), the first Hindu monk from India to teach Vedanta in America, addressed the World's Parliament of Religions, held in conjunction with the World's Columbian Exposition. His unprecedented success opened the way for the dialogue between eastern and western religions." On 11 November 1995, the stretch of Michigan Avenue that passes in front of the Art Institute was formally conferred the honorary name "Swami Vivekananda Way." However, he had to bear great criticism from other orthodox Hindus for having traveled in the West. In his day there was hardly a Hindu in America and he received criticism for crossing the ocean, at that time a cause for "outcasting." Vivekananda scoffed at these critiques from the orthodox saying "I cannot be outcast - As a monk, I am beyond caste." His contemporaries also questioned his motives, wondering whether the fame and glory of his Hindu evangelism compromised his original monastic vows. His enthusiasm for America and Britain, and his spiritual devotion to his motherland, caused significant tension in his last years. On July 4, 1902 at Belur Math near Calcutta, he taught Vedanta philosophy to some pupils in the morning. He had a walk with Swami Premananda, a brother-disciple, and gave him instructions concerning the future of the Ramakrishna Math. He passed away in the evening after a session of prayer at Belur Math. He was 39. Doctors pronounced that the death was due to apoplexy, but the monks were convinced that he had attained mahasamadhi, as Sri Ramakrishna had predicted. Vivekananda had fulfilled his own prophecy of not living to be forty-years old. This box: view o talk o editVivekananda was a renowned thinker in his own right. One of his most important contributions was to demonstrate how Advaitin thinking is not merely philosophically far-reaching, but how it also has social, even political, consequences. One important lesson he claimed to receive from Ramakrishna was that "Jiva is Shiva " (each individual is divinity itself). This became his Mantra, and he coined the concept of daridra narayana seva - the service of God in and through (poor) human beings. If there truly is the unity of Brahman underlying all phenomena, then on what basis do we regard ourselves as better or worse, or even as better-off or worse-off, than others? - This was the question he posed to himself. Ultimately, he concluded that these distinctions fade into nothingness in the light of the oneness that the devotee experiences in Moksha. What arises then is compassion for those "individuals" who remain unaware of this oneness and a determination to help them. Swami Vivekananda belonged to that branch of Vedanta that held that no one can be truly free until all of us are. Even the desire for personal salvation has to be given up, and only tireless work for the salvation of others is the true mark of the enlightened person. He founded the Sri Ramakrishna Math and Mission on the principle of Atmano Mokshartham Jagad-hitaya cha (for one's own salvation and for the welfare of the World). 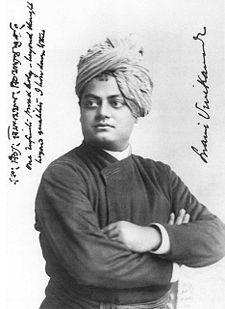 Vivekananda was a soul of puissance if ever there was one, a very lion among men, but the definitive work he has left behind is quite incommensurate with our impression of his creative might and energy. We perceive his influence still working gigantically, we know not well how, we know not well where, in something that is not yet formed, something leonine, grand, intuitive, upheaving that has entered the soul of India and we say, "Behold, Vivekananda still lives in the soul of his Mother and in the souls of her children. --Sri Aurobindo--1915 in Vedic Magazine.
" It is not the sign of a candid and scientific mind to throw overboard anything without proper investigation. Surface scientists, unable to explain the various extraordinary mental phenomena, strive to ignore their very existence." " What little I know I will tell you. So far as I can reason it out I will do so, but as to what I do not know I will simply tell you what the books say. It is wrong to believe blindly. You must exercise your own reason and judgment; you must practise, and see whether these things happen or not. Just as you would take up any other science, exactly in the same manner you should take up this science for study."